The barrage continues from Native Instruments with the release of three new keyboards from the Kontrol A-Series range. Available in three variants, these streamlined keyboards allow easy access to your instruments and effects at a very affordable price. Whether you’re in need of a keyboard to find sounds, capture your own, tweak, perform or all of the above; the keybed on the Kontrol A-Series is best in its class. What’s more, Native Instruments have chucked in a whole range of professional grade instruments to get you started to improve your work. Its sleek, smart and streamlined to take centre place on stage, or at your desk. Its important to firstly mention the brilliant semi weighted custom NI keybed; its a pleasure to use and deserves praise at this price point. Above the keys are eight touch sensitive control knobs for extended access to FX and instrument parameters within your DAW. Also to the right of these control knobs is a 4-directional push encoder, making very light work of sound browsing and navigating your project. Pitch and Modulation wheels are also the perfect size and feel to be ergonomic. Also in the rotary area of the keyboard is a new crisp and clear OLED display for easy at-a-glance navigation of your sounds and parameters – tasty! Komplete Kontrol A25, a 25 key controller keyboard spanning 2 octaves and only weighs 2.4kg for easy portability. Komplete Kontrol A49, the 49 key variant with 4 Octave capability with the same awesome semi weighted keybed as both of its smaller and bigger brothers. Kontakt 6 Player – which includes 50 instruments within itself! The Komplete Kontrol A-Series allows pre-mapped control of Komplete Instruments and Effects (best check out our page highlighting the new Komplete 12 Range) as well as hundreds of NKS (Native Kontrol Standard) approved plug-ins from the leading manufacturers through Komplete Kontrol Software. Also thanks to this little bridging software you also have the added benefit of Smart Play; which allows you to stay in key with well over 100 scales and modes or play chord progressions with single keys. Smart Play also lets you map any scale to white keys only, assisting play and performance. Integration is very, very deep within Maschine for creating chord progression and rhythms – remember the full Maschine Essentials is included! 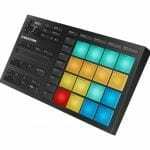 (so you can get playing before buying new Maschine Mikro MK3?!?). We love the fact that control is fluid and intuitive with the big DAWS such Logic Pro X, Ableton Live, GarageBand straight away. We also have news that Cubase and Nuendo will be integrating with the Komplete Kontrol A-Series in the coming months (maybe weeks!). It’s also worth mentioning the range of keyboards support VSTi and VST FX. The S88 has a professional grade weighted Fatar keybed with aftertouch capability. These keys are fully weighted, hammer action keys. Ooooff. Browsing on the S88 can be done with the controls and dual display within the Kontrol S88 itself for tweaking, mixing and browsing, which can be tag based. This makes the world of difference as it makes finding sounds and previewing them a breeze. Also within the S88 is the full RGB light guide. This highlights drum cells, key switches as well as chords, scales and key splits (this applies for both NKS instruments and MIDI mode). Also available are two assignable pedals for volume, expression and sustain. Should you wish, this can also be assigned to effects for further expression eg filters or FX parameters. Hey guys, I’m hoping for the 25-key version soon. Fingers crossed!